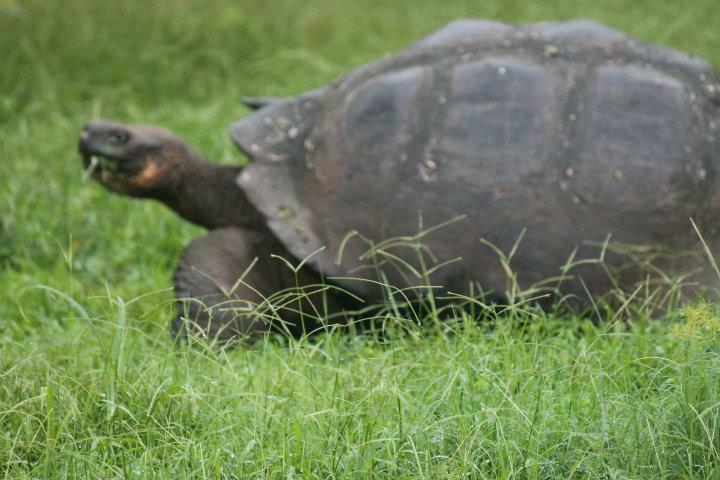 Galapagos Islands, Ecuador - February 14 & 15, 2015 - Blog from Tomás de Berlanga, Ecuador | South America!! Today is our last day of not only this Galapagos voyage but of our South American adventure. Yes, we are a little sad, but yet, we are happy to return home. We started this trip thinking it might be our one and only visit to South America, but we have learned so much and fallen in love with the countries here and their immense diversity that, yes, we will return. Perhaps not to repeat the spots we visited on this trip but to see new places to expand our vision of so much more than could possibly be covered in one simple 31-day trip such as this. Today we traveled to the north end of Isabela Island and walked lava fields finding sea birds, such as the Great Blue heron, the Lava Heron, Galapagos Penguin, Flightless Cormorant, the American Oystercatcher and the Storm Petrel - precious little fishing bird who appears to literally dance on the water We saw more marine iguana, more sea lions and a group of fur seals. This island has been receiving some rain so one side of it was green already but the other side of the island is still brown. Again, this is the wet season for this part of the world, it just has not begun yet. The sky, however, looks more promising than we've seen it before. I think the rain will arrive just about the time we depart for home. After the 2-hour hike and lectures along the way, we were allowed time to snorkel or swim in the bay. I am so proud of Stan, I could just beam! Some of the people we got to know on this Galapagos trip was a couple from Great Britain, Norman and Jane. Because there are few opportunities to swim in a lake or river in their homeland, they had never snorkeled. At each opportunity for snorkeling, they were mighty good sports and simply sat on the beach while the rest of the guests enjoyed the water and the fantastic sights only seen below the surface. Last night at dinner, Stan told them we'd have a great opportunity for them to learn to snorkel the next morning since we'd be doing so off the beach. He told them he was going to teach them. Being the good sports they are, they agreed. And he did it! I couldn't watch - I was afraid I might interfere. Other guests told me he was so very patient with them. He worked with them for a good 15 minutes or so going slowly one step at a time. Then I looked up and there the three of them were, Stan, Norman and Jane well out beyond the beach, exploring a reef, like well-seasoned snorkelers. Stan did it. He opened up a whole new world they might have otherwise missed had he not urged them to give it a try and had he not taken the time to patiently teach them. This will always be a special day in my book for Stan Weeks. I'm so proud of him and I love him even more. Norman and Jane got to see all the things the rest of us did - swimming sea lions, rays, sea turtles and colorful, colorful fish. What a day! I get a little misty thinking about it. Ok, I have been thinking about how to approach why Galapagos. What makes it so unique? Why it is an important destination, and how can I summarize it adequately and accurately. Even yet, I cannot say with 100% certainty that what I'm about to tell is totally correct but I hope I can relate the much abbreviated big picture. First, we have learned that the Galapagos Islands are relatively new in the grand scheme of the earth. They were created as a result of volcanic eruptions. They are roughly only 5 million years old, while much of the rest of the world is 20 million years old. The point most typically raised about the islands is a visit to the Galapagos Islands in 1859 was the inspiration of Charles Darwin's book, On the Origin of the Species. As we all know, this thinking that changed things forever. The interesting point, however, is that Darwin was a not a trained naturalist when he arrived here. He had studied medicine but did not like it. He studied the ministry but again did not complete the studies because he did not like it. He arrived in the Galapagos Islands on the ship, the H.M.S. Beagle because he was hired as a gentleman's companion for the ship's captain, Captain Robert FitzRoy - in those days, the captain of the ship did not socialize with the crew, thus the captain's life was a lonely one. Charles Darwin was only 22 when he arrived in these "Enchanted Islands" on The Beagle in 1831 or so. His first impression of the islands was that they were vile, evil, hostile places not fit for man nor animal. Darwin was in the area of the Galapagos Islands for only five weeks and he was on land in the islands for only a total of 19 days. During that time he collected vegetation samples and animal specimens. It was not until much later did he realize from studying the specimens that animals he observed there were similar to animals found elsewhere in the world but had characteristics that made them different from others. It occurred to him that these animals had evolved through the process of natural selection (survival of the fittest) which produced new generations of animals better adapted to survive in this harsh environment and to make it their home. We finished up the day with a hike on the vast lava field on Isabela Island. The Island of Isabella is 5 million years old, but the lava field we walked upon is only 150 years old, and this lava field did not occur as a result lava flowing down the hillside of one of the nearby volcanoes during an eruption, but it bubbled up from below the water and formed the new landscape of ropey lava containing thick deposits of iron. Today these iron elements are cracking and beginning to oxidize causing the thick surface of lava to buckle, crack and sink. Slowly, slowly, this land form of lava will sink return once again return to the depths of the ocean. What does not sink and remains will become soil and will take on the appearance and characteristics of the Island of Isabela. The black lava contained interesting designs only to be seen here and nowhere else. The markings on the lava made me think of the markings fudge takes on when cooked to just the right temperature, just before it is poured out on a surface for spreading, cooling and slicing. We stayed up late on this last night of our Galapagos tour. We made friends in the past 4 days and this was our night to solidify our friendships, tell funny stories, exchange email addresses and have a few glasses of wine. It was so, so much fun. To all those reading this blog now and who were on the Coral I, we thoroughly enjoyed our time with you. It was our true pleasure to meet you and spend this bit of time with you and I hope we meet again someday. To you, Vida Feliz! Our South American adventure has come to an end. We are at this moment, in Quito, Ecuador, awaiting our flight to Atlanta which does not depart until 12:25 am on February 16. We expect to land in Atlanta around 6:30 and hope to be in our sweet home in Sandy Springs by 8:30 am or so. Tired, I am sure, but I'm even more sure we will be full to the brim of great memories.